So you’ve heard that 2011 is really going to be the year of mobile…after a few years when mobile was considered the next hot thing. But this time the numbers really do support the excitement, and business owners should be aware of just how big mobile is getting. 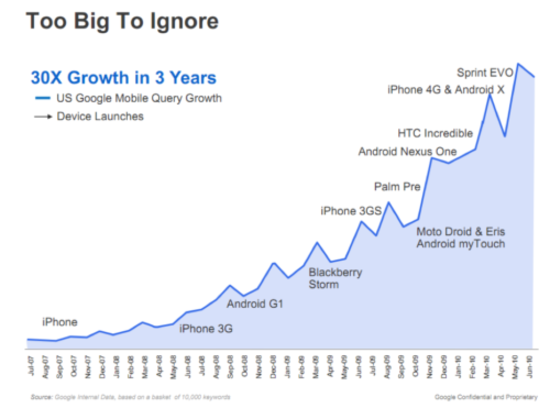 As the chart below outlines, mobile search – that is, searches of Google made from mobile phones instead of computers - has grown 30 times in just three years. With the introduction of each major new device, a spike in mobile queries can be seen. 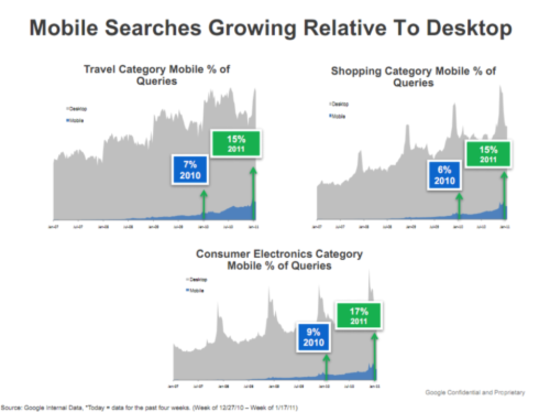 Below you can see the explosive growth in mobile search queries in specific categories from 2010 to 2011. Note that mobile search is not cannibalizing desktop searches. Both are growing still, but mobile is growing much faster. Convinced that mobile matters? Good. Now we can move on to the things that every business owner needs to know about mobile websites. Don’t assume that everybody visiting your website on a mobile phone wants to be served a mobile version of your website. With the sophistication of mobile phones available today, many people see mobile websites as unnecessary. But others do like their functionality, as they're specially designed for the tiny screen. Hence, options. The best-designed mobile sites detect when a new visitor is using a phone, and display a message asking whether the visitor would like to be taken to the full site or the mobile site. Then the site drops a cookie - a small text file - onto each visitor’s mobile browser to indicate which version of the website is preferred, and that’s what is displayed on the next visit. Keep in mind that some websites have such complex or outdated code, it isn’t really practical to retroactively build a mobile site. If you're thinking about getting into the world of mobile, you don’t really need to know much about web design or development. But it can help to have some background in website technology so you can understand a mobile developer better when you set out to hire one. The section below offers a basic explanation of current website technology. First, CSS (cascading style sheet, or style sheet for short) is a coding language that tells browsers what to make things on your website look like. For example, CSS can be used to say what color link text on your site is, how big your headers are, or the background color of your website. CSS is also used to tell the browser how elements on your website should be placed, and how big they are. Some sites take up the full width of the browser window, while others appear to be contained within a box floating in the middle. It’s easiest to think of HTML as holding the content of your site - that is, images and text - while CSS determines what it looks like and how it’s all arranged. So now that you’re totally lost, let’s bring it back with an analogy. My girlfriend and I live in a small apartment, and sometimes disagree about how our furniture should be arranged in our combination kitchen, living room, dining room, office (like I said, we don’t have a lot of space). Let’s imagine that, when I walk in the door, all of the furniture is magically arranged exactly how I want it. The couch is facing the TV (instead of the window), the lamp is back in the corner, and the desk and computer that just take up scarce space are….gone. When my girlfriend comes in and I’m not there, her desk and computer are back, and the couch is how she likes it. The furniture is the HTML, and the arrangement is the CSS. Mobile style sheets simply arrange your content in a way that looks good on a mobile phone (by the way, I’m the iPhone—my girlfriend is a laptop). The goal is to have one website you can update easily, and have it display in two different formats – mobile and desktop. It doesn’t make sense to create a mobile website that exists on its own. Who wants to update two independent websites each time there’s some small change? I sure don’t. Fortunately for you, a modern website can have both a mobile version and a desktop version while still being essentially a single site. It would be nice if it were that easy with a modern small apartment.